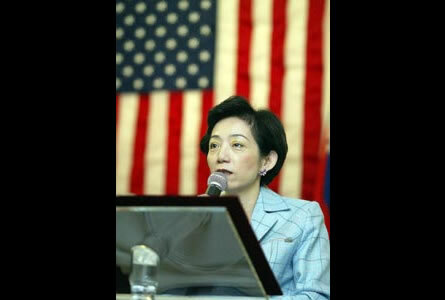 Wu Sue-jen will be the first Taiwanese first lady to visit the U.S. During the 10-day visit, Wu will not meet U.S. government officials to avoid provoking Beijing, but she will attend a reception hosted by the U.S. Congress and address the American Enterprise Institute think tank. 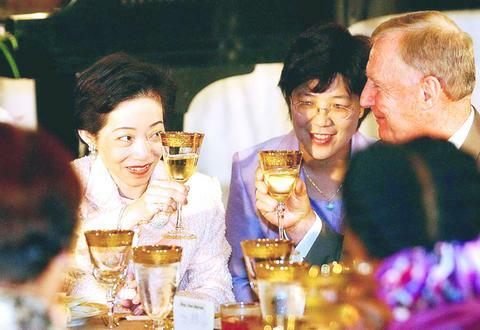 "We don't think the visit of the first lady is going to have any ill effect on triangular relations primarily because it is a private visit," Joseph Wu, the president's chief of staff, said, referring to Taipei's ties with Beijing and Washington. Washington switched diplomatic recognition from Taipei to Beijing in 1979, but remains the island's main arms supplier and trading partner. "We urge China not to respond in a negative way because it's not going to be helpful to triangular relations," Wu said. Beijing has considered Taiwan a breakaway province since 1949 when Chiang Kai-shek's troops lost a civil war to Mao Zedong's Red Army and fled into exile. Beijing has sought to push the democratic island of 23 million people into diplomatic isolation by limiting its contacts with other countries. 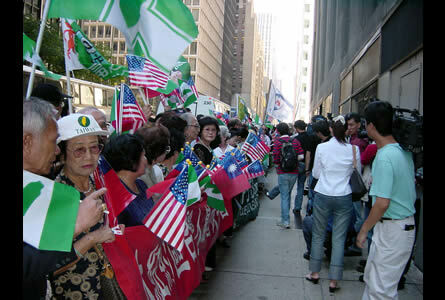 For decades, the United States discouraged high-level contacts with Taiwan officials to avoid angering China. But President Bush has shown more overt support for Taiwan since he took office in January 2001, pledging to do "whatever it takes" to defend the island. Bush offered last year to sell the island up to eight diesel-powered submarines and four Kidd-class destroyers -- the biggest U.S. arms package for Taiwan since 1992 when his father sold Taiwan F-16 fighters. 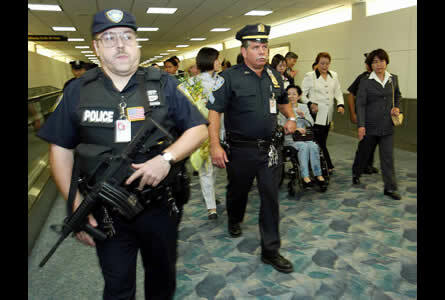 President Chen was allowed to make unprecedented stopovers in the United States last year on his way to and from Latin America. But a visit to the U.S. capital by Taiwan's leader would inevitably anger China. Wu and her 23-member delegation will also travel to New York and Los Angeles, where they will attend a symphony performance, visit an art museum and meet Taiwan expatriates. If we're not an independent nation, how could I be a first lady? 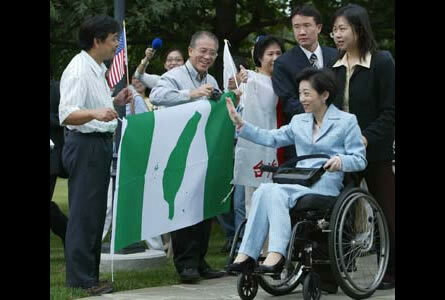 "Taiwan definitely is a sovereign nation", Wu Sue-jen told The Associated Press. "If we're not an independent nation, how could I be a first lady?" Wu said in the palm tree-shaded presidential residence in southwest Taipei. 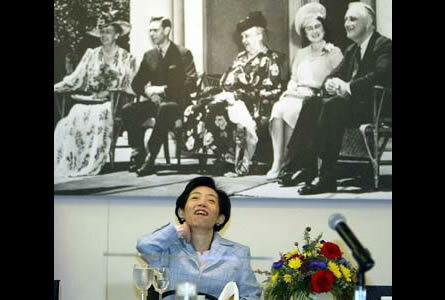 Wu, who leaves Thursday, will be the first Taiwanese first lady to visit Washington. USA President Bush has adopted a friendlier policy toward Taiwan, and Wu's visit is the latest example of Washington's new flexibility. 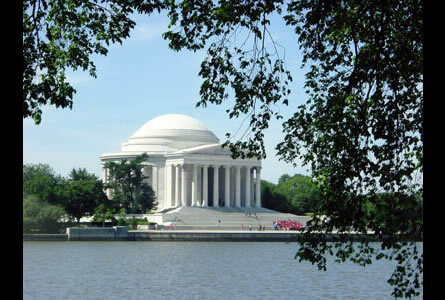 Her nine-day trip includes stops in New York , Washington and Los Angeles. ``World leaders should have the freedom to visit other countries, and I think Americans will be able to agree with this,'' Wu Sue-jen said in her raspy, low voice. The first lady plans to speak at the National Arts Club in New York on Friday. She also will speak at the American Enterprise Institute think tank in Washington on Sept. 24 and attend a congressional cocktail reception in her honor Sept. 25. Wu said her speeches would focus on Taiwan's success in evolving from authoritarian rule to democracy. She sees no need to mention Taiwan's claims that it is not part of the communist People's Republic of China. ``I don't need to keep repeating this. It's just like I don't have to keep emphasizing that I'm a woman,'' she said. Traveling abroad is difficult for the frail, wheelchair-bound Wu, since an apparent murder attempt, paralyzed from the waist down since a truck hit her in 1985 during Taiwan's repressive martial law era. Mrs Wu arrived in Washington from New York, where she made a speech at the city's National Arts Club on Taiwan's democratic development. Referring to Taiwan's failure to secure a seat in the United Nations, she said she believed that with perseverance, Taiwan would one day achieve its goal. The first lady will do some sightseeing in Washington on Monday before delivering another speech - to the American Enterprise Institute think-tank on Tuesday. 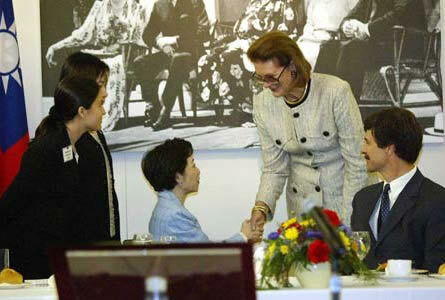 Mrs Wu is also to attend a reception in her honour at Congress on Wednesday. 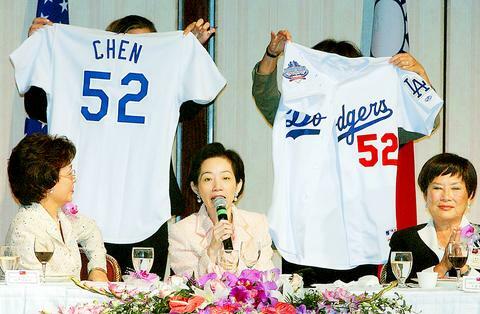 She will then travel to Los Angeles, where she is expected to meet Chen Chin-fen, who plays for the hometown Dodgers baseball team, and is the first Taiwanese to reach the major leagues. 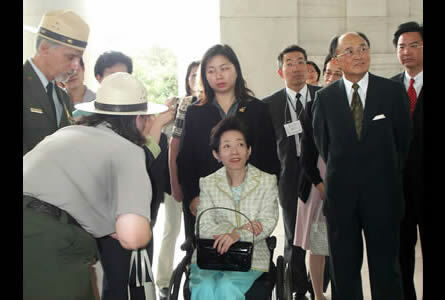 Washington -- Senators praised Taiwan's First Lady Chen Wu Sue-jen September 25 as she was concluding a visit to the United States. She was scheduled to depart the United States September 26. 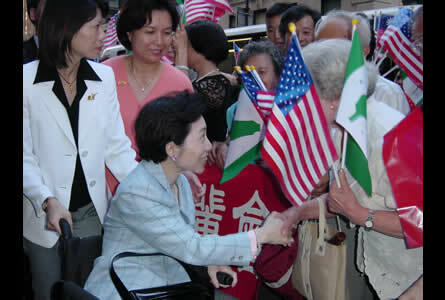 "I extend my warmest welcome to the First Lady of Taiwan, Chen Wu Sue-jen, who is in Washington this week to visit with some of her and her husband's many friends here," said Senator Jesse Helms (Republican of North Carolina), the ranking minority member of the Senate Foreign Relations Committee. "I am among the many admirers of President Chen," Helms said, calling him "a courageous leader." 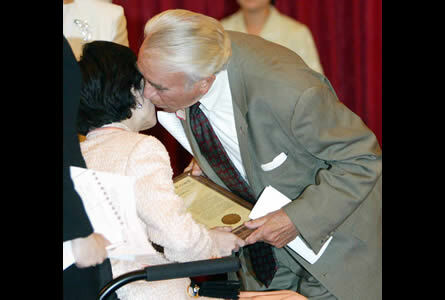 "The courage of his wife has earned for her great respect," Helms added. 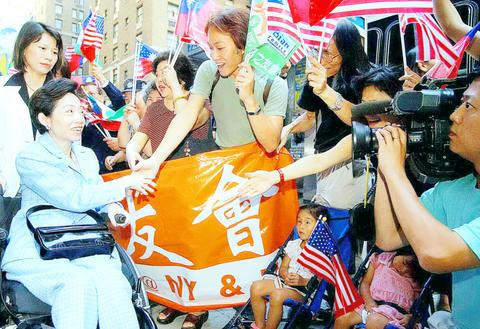 "In 1985, while supporting one of her husband's campaigns, Mrs. Chen Wu was hit by a vehicle that left her paralyzed from the waist down." According to Helms, that episode was believed by many to have been politically motivated, and it left her permanently confined to a wheelchair. "The following year when her husband was imprisoned by his political foes, Mrs. Chen Wu sought election on his behalf for a seat in the national legislature, Helms said. 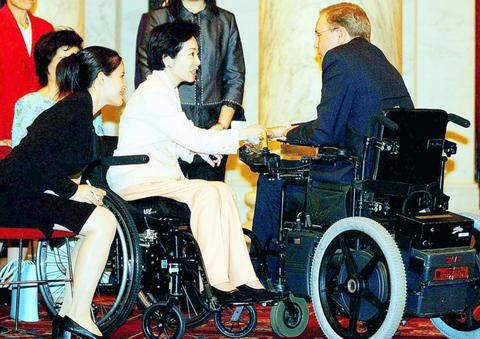 "She won and served in the legislature in spite of her serious injury," thus keeping Chen Shui-bian's "political cause in the public eye." Chen Wu, he added, "provided indispensable encouragement and support" as Chen Shui-bian progressed from legislator to Taipei Mayor to President of Taiwan. 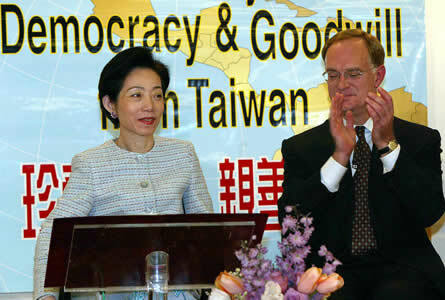 "First Lady Chen Wu Sue-jen was instrumental in building Taiwan's early, unequivocal and generous support for the United States and American people following the attacks on September 11, 2001," Helms said. "She comes to the United States this week with a message of Taiwan's continuing strong support in the war against terrorism," Helms said. 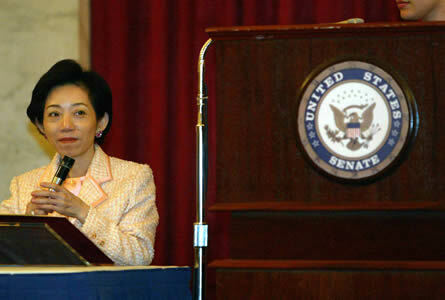 "I know that Senators will share my appreciation" for Taiwan's friendship and solidarity. 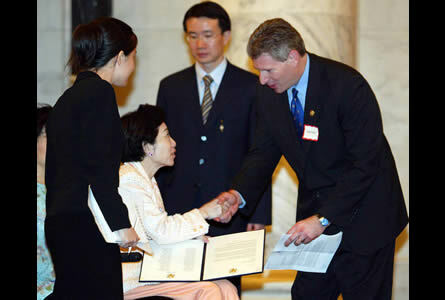 Senator Christopher Bond (Republican of Missouri) praised the Taiwanese First Lady as "a strong and effective advocate for Taiwan's physically challenged citizens." 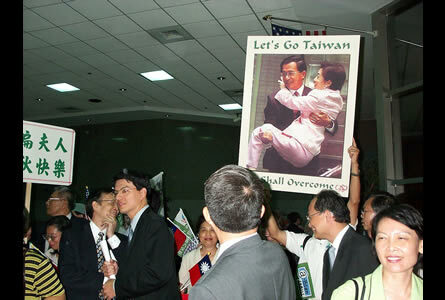 Throughout all her trials, he added, "she has remained solid in her support for her family and the people of Taiwan. This strength of character has contributed much to the First Lady's greatness." Bond said First Lady Chen Wu was bringing a message of "cooperation and support from the Taiwanese in our joint antiterrorism campaign." 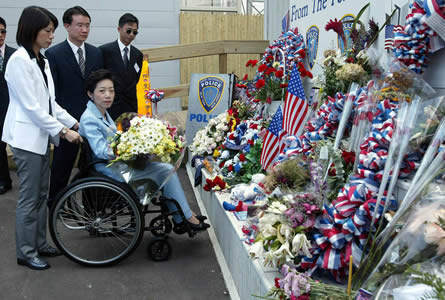 Bond said Taiwan had demonstrated "charity and humanitarian assistance to the victims of the terrorist attacks on September 11, 2001." 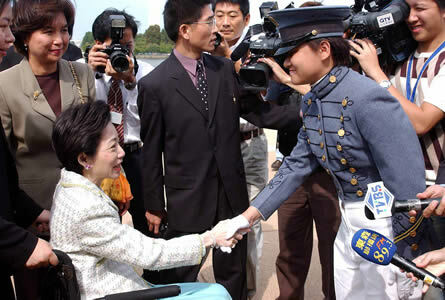 Senator Mary Landrieu (Democrat of Louisiana) described Taiwan's First Lady as a "unique and remarkable woman." 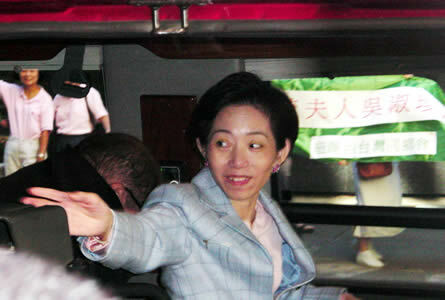 First Lady Chen Wu is Taiwan's youngest first lady, Landrieu said. "Men and women of all political parties admire her as a genuine person." 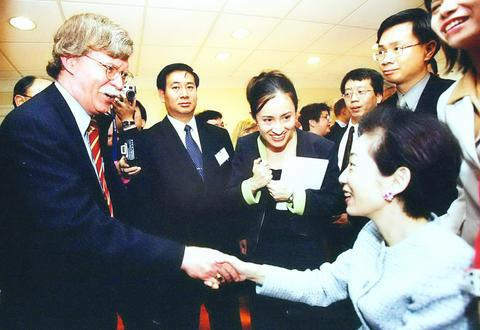 In a surprising development during Taiwan's first lady Wu Shu-chen's second full day in Wa-shington, John Bolton, the Under Secretary of State for Arms Control and International Security, held a lengthy personal discussion with Wu on Tuesday at the offices of the conservative think tank, the American Enterprise Institute. Bolton, an ardent friend of Taiwan and one-time Taipei Times contributing columnist, spent 20 minutes with Wu discussing a broad range of issues related to Taiwan, cross-Strait relations and the US, sources say. They would not give details of the discussions. 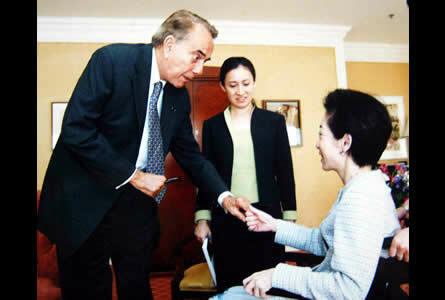 One source, however, said that one matter brought up was comments Bolton made that appeared in the Taipei Times the Monday following Chen Shui-bian's March 2000 election. In that article, Bolton was quoted as saying that the US should defend Taiwan against any possible provocation by China, including the frontline islands of Kinmen and Matsu. Bolton was complaining at the time about the Clinton administration's policy of "strategic ambivalence" in favor of a firmer defense commitment. "If you make a commitment to the use of forces, it has to be a commitment to win," Bolton was quoted as saying. He also warned at the time that in view of the upcoming US presidential election, "I think your transition from election to inauguration [of Chen as president] is a potentially dangerous time." Word of the meeting spread after Bolton appeared at a reception for Wu following the first lady's delivery of a speech at the think tank on Taiwan's path to democracy and her and her husband's political struggles toward the presidency. Bolton was close-mouthed when approached by reporters at the reception. "I'll just say this very briefly: As an alumnus of AEI, I'm very glad she's here and I look forward to the opportunity to talk to her a little bit more." Pressed by reporters, he said, "I'm here as Under Secretary of State and an alumnus of AEI. That's really all I have to say." In an effort to not overly annoy Beijing, Wu's visit to Washington is being billed as a private one on both sides. Taiwan officials say that she is not scheduled to meet any George W. Bush administration officials, although some Taiwan sources say that senior State Department officials may telephone Wu to greet her and hold discussions. Wu emphasize Taiwan's desire to gain admission to the UN, a theme she stressed in New York last week. "Even though we are not a member of the United Nations, as long as Taiwan keeps the faith and perseveres, we will eventually be able to joint the United Nations again," she said. "We believe that Taiwan is a democratic and free country which respects human rights. There is no reason for us to be excluded from the community of nations. I have confidence that our ongoing effort will enable us to obtain our deserved representation. I also believe it would give us the opportunity to contribute and to play out our responsibility as a member of the global village." The term, "global village," which Wu has also used before during her trip, is reminiscent of former US first lady Hillary Rodham Clinton's book title, "It takes a village", a phrase that has entered the American vocabulary. Wu was expected to meet Clinton during the congressional reception. They just can't see that she won it herself. For the independence they now struggle to keep. Even so, more is taken each day. Has far more than them." All born Equal, wild and free. Others are no more different than we. China wanted the island back. When they try to poke his eyes? Sitting on the evidence of her bravery. When dreams of freedom were caged inside. And still are fighting today. For Formosa, the beautiful isle, it was named. Until the day when Red Dragon. Would take back its waiting claws. Not to bind them in the house. Waiting for this all to end. And she knows Freedom is the key.